A labor watchdog group filed a complaint with the IRS challenging a worker center's non-profit status. The Center for Union Facts lodged a complaint to the agency accusing the Coalition of Immokalee Workers (CIW) of being a union front group organized as a nonprofit in order to avoid federal labor regulations. The coalition is a worker center, which has successfully helped agricultural workers in Florida receive additional pay from companies that use the vegetables they harvest. The complaint says the worker center should be forced to file as a labor organization, rather than as a tax-deductible nonprofit because it serves a specific set of people, agricultural workers, rather than the general public. "By CIW's own admission it does not serve the public at large but instead a group of workers seeking concessions from their employers," the complaint says. "We respectfully request that the IRS examine CIW's Forms 990 for 2013, 2014, and 2015, and, if appropriate, revoke its tax-exempt status." The coalition, which represents 40,000 workers, did not return request for comment. The CIW has been one of the most successful worker centers in the country, taking on some of the largest corporations in the country. It launched a protest campaign against McDonalds that ended in 2007 after the company agreed to pay an additional penny per pound of tomatoes to benefit workers—though some workers have sued claiming that they did not receive their share of the money from CIW. The CIW has since landed similar deals for workers with other grocery and chain restaurant companies and incorporated them into its Fair Food Program. The CIW now has Wendy's in the crosshairs, waging a boycott campaign against the eatery to force them to participate in the program. While labor unions are bound by election or card check agreement regulations in order to win representation for members, worker centers do not need to prove they are supported by a majority of the workforce. They are also able to stage rolling walkouts and secondary boycotts like those they used first against McDonalds and now Wendy's—tactics that unions are barred from using. 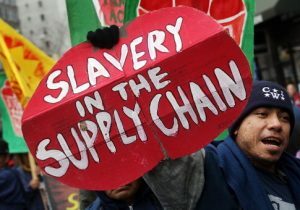 "The very premise of the program—that supermarkets and restaurants have to pay more to people who are not in their employ, or else face protests and boycotts—is more akin to blackmail and extortion than charitable activity," the complaint says. The complaint could pave the way for additional oversight of worker centers, which critics say bypass traditional labor law using their nonprofit status. While the Department of Labor and the National Labor Relations Board have overseen cases and complaints involving worker centers neither has clarified whether worker centers should be regulated as traditional labor unions. The IRS could settle that dispute by weighing in on CIW's status. Ryan Williams, spokesman for Worker Center Watch, said worker centers remain in "murky legal waters" because their actions reflect that of a union, even if their funding does not. "Many of today's worker centers have essentially become union front groups, cynically offering traditional worker center services as a false front designed to get a foot in the door whereby focus can shift to more traditional organizing and advocacy," he said. "Unions are creating, funding and working conjunctively with the most recognizable worker centers in the country because by utilizing worker centers they can evade the rules and regulations that govern their operations." Worker centers and other ostensibly non-union protest movements have received millions of dollars in support. In 2013, the SEIU, the AFL-CIO, and other top labor unions pumped $35 million into local worker centers. The CIW, unlike movements like SEIU's Fight for $15 or the United Food and Commercial Workers' initial OUR Walmart movements, does not receive substantial financial backing from a labor union.